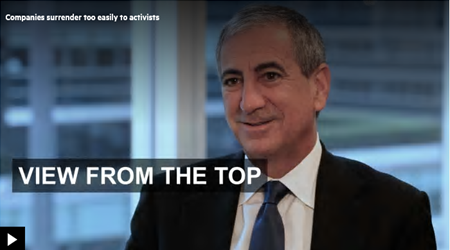 Companies under siege from activist investors are surrendering too easily, according to Ken Moelis, the investment banker, whose advisory firm has represented some of the most prominent activists. After a week in which Ebay acceded to the demands of Carl Icahn, the veteran activist, and agreed to spin off its PayPal unit, Mr Moelis said advisers to such companies were relying on old and ineffective strategies, likening them to “the Maginot line”, the doomed French defence which was bypassed by Nazi invaders in the second world war. Moelis & Co, which Mr Moelis took public this year, represented Herbalife, the seller of nutritional supplements, in its fight with Bill Ackman, the hedge fund investor, who has shorted the stock and accused the company of operating a pyramid scheme. Herbalife has denied Mr Ackman’s allegations. In an unusual move during that battle, Moelis approached investors in Mr Ackman’s fund, Pershing Square Capital Management, to argue that the hedge fund could be making a costly mistake. But Moelis has also represented activists, such as Starboard Value, an activist investor, which urged Smithfield Foods to break itself up. Mr Moelis argued that companies which give in to activists’ demands, such as the right to appoint board members or a large share buyback, were mistaken and being given bad advice from banks mounting the defence. He questioned whether clients of the large banks were able to overcome potential conflicts given the lucrative trading commissions and prime brokerage fees they made from some hedge fund activists. “Can you really fight an activist using the full range of options if you are their prime broker or if they are a very large client of your equities division?” he said. Mr Moelis is unlikely to attract the attention of activist shareholders at his company – even after going public in April – because he used the controversial ploy of holding shares with higher voting rights, which gives him control despite only owning a third of the company. The initial public offering fell short of the proposed range. Mr Moelis said that was due to circumstances outside the company’s control, such as “a slight invasion of Ukraine”, which spooked investors. But he said he never considered delaying the share sale: “These firms are all about momentum, zeitgeist and atmosphere – and the atmosphere was ‘let’s get this done’.” Shares in Moelis, which listed at $25, closed last week at $34.36, valuing it at $1.9bn. Moelis has enjoyed the pick-up in deal activity. Mr Moelis took an uncompromising view of one element of the strong M&A environment: the spate of “tax inversion” deals done by American companies, which acquire a company in a different country in order to relocate their headquarters and pay lower taxes.